The “Climate has always changed” argument always amuses me. If anybody says that I ask them for thermometer data proving that. When they can’t I ask how they know the climate has changed. Then they get stuck! It’s a remarkable feat of double-think to trust the paleoclimate data but not the Paleoclimatologists who produce it! That’s a nice colourful chart you’ve got there, of the Radiative forcings, Stefan. Are you expecting to have all your students to accept it with gullible, nodding approval? You’ve got all these ” anthropogenic” forcings, in watts/sq.m, and then the little slot for the “natural” solar forcing… irradiance of 0.12 w/sq.m. I would have thought that would be a tad out…maybe 168w/sq.m in your case…perhaps 340w/sq.m in my case? Regarding (4), I think there is some truth in that, not because of theoretical physical arguments, but because of human psychology. I really have my doubts that enough of the global population do, or will take it seriously enough to drive those with the power and influence to take proper action on a nationwide scale (i.e. not micro-steps that ultimately make a negligible difference). The hard-wired cognitive biases that worked well for survival in the hunter-gatherer days, but are dreadful in today’s completely different complex civilizations, are too powerful to overcome, we collectively don’t have sufficient intelligence to override in the face of the evidence which strongly suggests we should. Perhaps if humans were more like Vulcans, and operated by logic and reason instead of feeling and emotion, we’d not be in this situation, but sadly this is not the case. I am a skeptic of the claims regarding 50,000 years of future Holocene-like conditions. Aren’t the neo-glacial readvances and other signs of a cooling climate during the past 3,000 years evidence of a gradual return to glacial conditions (prior to the anthropogenic influence brought on by the industrial revolution)? Isn’t Milankovitch forcing only the pacemaker for an inherently wobbly glacial-interglacial oscillatory system? I understand this point of view, but I don’t know how far logic and reason would get us. Fundamentally, we need to care about future generations and other sentient beings. Which, it would seem, we don’t; or not enough of us in positions that matter. I know that, to use a cliché, accountants and even some economists might be persuaded by the cost/benefit analysis showing costs of inaction outweigh the benefits. However, I think that approach is going to have limited success in the long run. We need a shift in hearts/minds . People in public (and private) office could, for example, be required to demonstrate compassion before being put into office and, when in office, maintain (say) regular compassion meditation practice. Just a thought. Regarding (4), I also think there is truth in it. Of course ! There is strictly no evidence (and actually rather a lot against) that 7+ billion people might ever live in a decent way on renewable or even nuclear energy. Curbing massively the fossil fuel use means most likely harming and eventually killing the poor and even middle classes and there are a lot of them and they most likely won’t “accept” it. Is there any doubt about the outcome if someone is given the choice to die right now or possibly in a few decades because a computer model tells him or her so ? All along their evolutionary path, living creatures, even humans, did and could never behave otherwise. Immediate survival must outweigh everything. Fossil fuels (un)fortunately permitted human population to overshoot and most likely only running out of this resource may stop the CO2 emissions. It’s unlikely to be the climate threat. But that’s exactly what you did not do. I hope Gavin is not holding his breath as he waits for the penny to drop for you. Minor editorial point – the entry opens with four yes/no questions, and then asserts that “not one of these answers is correct”. This implies to me that the “correct” response in each case would be “other”. If I were defending the guy against the forest fire charge, I’d have statistics for every fire started by lightning going back to when records began; I’d have a list as long as your arm of the other uses those ‘accelerants’ could be put to; i would not allow any mention of previous history of arson; i would find character witnesses; In short, I would create reasonable doubt. He’d be acquitted. 100 scientists published a book rubbishing einstein’s theory of relativity. Consensus belongs in religion, not in science. I expect Stefan’s students would apply critical thinking to WHY the chart shows solar insolation as 0.12W/m2 instead of the 340W/m2 they might have naively assumed. It might enable them to understand what the diagram shows. Whether you are gullible enough to accept the figures as accurate depends on how much credibility you put in the multitude of observational measurements taken by different methods over many decades by diverse groups of researchers that form a strong consilience of mutually supporting evidence for the validity of the estimates and the possible errors. Aaah, another funny game with the deniers^^ Uh uh,we got lots and lots of time to play funny game with the deniers, yes? Wow @Mack, that feeling, ah, when you deliver a nice checkmate only to realize you were playing suicide chess! Stefan–On target again. However, on Item #4 about stopping Global Warming, knowing climate change inertia, particularly the physics of that process, would help in the argument that we can do something about the rate of warming. Knowing the assumptions in such calculations is required, all stated in elementary terms for best effect. Perhaps this is an esoteric frustration, but the claim itself is “not even wrong,” at least without defining a reasonable level of granularity for what constitutes “climate change.” I have at least a magnitude and temporal dimension in mind. To the uninitiated, I suspect the claim reads as though climate is a highly variable entity (it would be worth polling an audience for how they interpret it) that just gets up on its own and does what it wants on decadal timescales, sort of like a random walk that is unconstrained by any physics. But how many actual distinct in-Holocene “climates” are there? Surely, the climate from 1600-1629 was slightly different than that from 1630-1659, or 1400-1429, but not by very much. How many distinct climates are there over the past 1 million years? Glacial, interglacial…at a somewhat finer level the mid-Holocene is distinct from the late Holocene, or a stadial different from an interstadial glacial. So, that is maybe half a dozen distinct climates (while retaining some statistically distinct robustness), and the bigger differences tend to be more slowly evolving in time. Geologically speaking, there’s some large changes…the oxygenation of the atmosphere, snowball (or quasi-snowball) events, the Eocene hothouse periods, etc. All of these things, however, are embedded in a long 4.5 billion year history, giving you a pretty low “climate change density” in time. There’s temporal resolution loss as you go back, but I suspect that for a given background climate, there’s a lot of “boringness” within it (e.g., how much in-Eocene or in-Snowball variability do we actually expect? Likely not enough to matter much for organisms adapted to the broad environmental boundary conditions at the time). It’s easy to understand why human activity has substantially increased CO2 in the atmosphere in the industrial era. But what non-human causes produced the high levels of CO2 in past times that caused hot periods with much higher sea levels? And, absent the “recent” human-caused increases in CO2, when would non-human causes have done the same thing? the “climate has always changed” argument is not advanced in good faith unless it is advanced in total ignorance of climatology. It is not a good use of time to engage with anyone this ignorant and/or dishonest. Remember that it makes no sense to mudwrestle with pigs, you both get dirty and the pig likes it. I had been thinking about the statement “The climate has always changed” just last week, and it seems to me to be untrue! The climate during the Holocene has been stable. It did not change, allowing modern civilisation to emerge. In the previous period, the Younger Dryas stadial (YD), it was fairly stable too, although very cold. There was, of course, an abrupt change at the end of the YD, although the abrupt change at the start is better known. So my point is that the climate is not always changing, but when it does change it does so abruptly. You can see this effect if you study sedimentary rocks. They consist of beds where the climate has remained stable,and bed surfaces where the climate has changed abruptly and a new stable bed has begun to be deposited. This corresponds with the evolutionary concept of punctuated equilibrium. So AGW will not be a slow rise in temperature corresponding to a linear sensitivity. It will result in an abrupt change from the current stable state to a new stable state. When a tipping point is reached, positive feedbacks will overwhelm the negative feedbacks that are keeping the present climate stable. The sea ice melted when the intensity of solar radiation passed a tipping point, and the YD ended. The remaining sea ice will disappear when CO2 passes a tipping point, and another abrupt change will happen. “Whoever tells you that the fact that “the climate has always changed” is somehow reassuring, does not know what he is talking about – or he is trying to con you.” This is a great post on an important subject. “Whoever tells you that the fact that ‘the climate has always changed’ is somehow reassuring, does not know what he is talking about – or he is trying to con you.” This is a great post on an important subject. 5) Before mankind, all climate change was from natural causes. In response to Adam Lea, there is an interesting article in NYT about how the international and massive response to the perceived Y2K threat serves to inform how we might successfully respond to climate change. It highlights the psychology (mostly fear) that took hold mid-1990’s to prevent what was thought to be able to disrupt many critical data systems globally triggering financial and societal collapse. While misplaced in the grand scheme, it highlights how fast the mobilization was – and how many systems were upgraded to short and long term benefit. It also points to our need to pull people on board, with the opportunities and benefits to the solutions – energy conservation, electric cars, smart communities, hubbed transit, renewable energy – which inspire action, bring hope and energizes people to take part. When examining the many graphs depicting the history of worldwide temperatures over the 20th and 21st centuries, I see no evidence of a long-term correlation between CO2 emissions and temperature. It’s not just a matter of the controversial “hiatus,” but the entire picture from the late 1800s to the present. I’ve made this point before, but never received a convincing response. From ca. 1910 through ca. 1940 we see a sharp increase in global temperatures. And, as has been pointed out many times, the CO2 levels of that period were only a fraction of what they are today and the rate of increase was low. No one can say with any degree of confidence what caused that rise in temperatures, but without it we would not be seeing the “record breaking” temperatures of today. Does anyone have any idea as to what caused that early 20th century rise? Other than “the climate is always changing”? “Though the principle may seem rather trivial, it is essential for model building because of what is known as the “underdetermination of theories by data”. For a given set of observations or data, there is always an infinite number of possible models explaining those same data.” (http://pespmc1.vub.ac.be/OCCAMRAZ.html) Complications of this sort are often referred to as “saving hypotheses,” with the implication that any theory can be “saved” from falsification by continuing to add complications until the data appear to support the theory. The notion of confirmation bias can also be invoked in this context. A similar issue arises when we attempt to evaluate the so-called “hiatus” of the 21st century, where we clearly see a major slowdown in temperature increase compared with the previous 20 years, during a period when CO2 emissions were soaring. If there is no clear correlation between CO2 and global temperatures then, as it seems to me, it becomes extremely difficult to argue for CO2 as the cause of the warmup we see over the last 100 years or so. Thanks for the clear and concise post. The link to the coral paper is formatted wrong. Adam’S (#4) thought (that we are doomed) ignores acceptance of #1 (that we can and are changing the climate). If you want to help, please check in with and support the 80% renewable electricity by 2050 initiative for Montana at http://www.mtcares.org . 26 of Montana’s 56 counties and 5 of 7 Indian reservations were just declared drought disaster areas. Thanks. Many middle aged and older people in the United States likely do not have a good intuitive grasp of metric system measurements. “People have always died!” And it is true: people have died even when other humans were not at fault. So what can we conclude from that? (1) that humans cannot murder other people? (2) that we do not know whether humans are to blame for murder? (3) that murder will not have any severe consequences? (4) that we cannot stop murder? Re: (3), of course 15’000 years ago the place was a bit less crowded and people were a bit more mobile so 120 metre sea-level rise was probably not directly harmful to too many people. Still, it also would by its nature tend to hide the archaeological record of its effects; I wonder what’s not been discovered in the Mediterranean, Doggerland and so on. Interesting civilizations are often near coasts so maybe prehistory would be rethought if such evidence was available. Wow Mack – stunning example of denier skills there. If you are still scratching your head, you could try reading the WG1 report for clues – especially the definition of forcing. I’ve often wondered how those who forward “the climate has always changed” line would react if they went to their doctor with a medical complaint and were told “people have always got sick” and were sent on their way. The issue here is trust. Whom do you trust more: some bureaucrat “negotiating” for your benefit during Paris accord, or some humble researcher working on artificial leaf (or an equivalent disruptive technology). That is right, if you read the history correctly, mankind advances are due to continuous flow of inventions, rather than political process. This climate agreement has been designed by committee. Search any park in any city, you’ll find no statue of committee. Yet another reason stefan so richly deserved the 2017 AGU Climate Communication Prize. Congratulations. It’s perfectly logical to be skeptical of AGW since, as noted, the climate HAS always changed. Probably less than 1% of people even in developed nations understand exactly how AGW really works, so it is reasonable for them to be skeptical. Yes, most know the story that CO2 inhibits the earth’s radiation from escaping, but few know why that is. It is not unreasonable to doubt things you don’t understand; particularly given the increasingly rejected globalist political motivation by many on the left (scientists) as well as the constant “correcting” of the scientific data and results; all reinforced by the irrefutable knowledge that our average earth temperature estimates older than 100 years are suspect at best. It may even turn out that AGW is a good thing – maybe Yellowstone or a big war will send a cooling layer of dust into the air, who knows. Not even Mr. Know It All knows……. Re:#1 by Tim C. The other aspect of the climate science deniers’ strange relationship with paleoclimatology is their belief that climate reconstructions going back hundreds of millions of years are wonderfully reliable but those going back 1000 of 2000 could not possibly be accurate. Mr. IAT does not explain why rather than reserving judgement until he does understand, he leaps to the conclusion that anything he doesn’t understand must be intentionally deceptive. 1) He proclaims it ‘given’ that ‘many on the left’ (including ‘scientists’ as a class), have a ‘globalist political motivation’. 3) He rashly states it’s ‘irrefutable’ (heh!) that estimates of GMST more than 100 years in the past are ‘suspect at best’, apparently implying that estimates of GMST up to 99 years in the past are more trustworthy. Can anyone say what’s truly ironic about Mr. IAT’s comment? That’s right: none of his risible notions are supported by evidence! Can Mr. In Over His Head really not see that his opinions about AGW are largely, if not entirely, informed by conspiracism? Isn’t he being perfectly illogical? Ha ha hah, how ironic 8^D! When you go to the emergency room with a gunshot wound, you don’t want the doctor wasting a lot of time interviewing you about the possibility of hemophilia in your family. Yes, people bled to death before guns were invented; but you, right now, are bleeding to death from a gunshot wound. It’s the same with natural climate change versus our current climate change. And yet for some people, the argument has talismanic power. That power is not intellectual, but emotional. Rick Perry is in need of particular help on attribution and the science of positive and negative forcings. Would someone please help him? Really. Maybe he can’t be helped, but maybe he can. The warming period from about 1920 – 1950 has been attributed to a combination of greenhouse gases (which were increasing through the period to some extent), solar changes, and unusually low volcanic activity. Its hard to be precise on proportions, because records are limited, but all have played a role. The flat period from about 1950 – 1970 is believed to be due to polluting particulate emissions from the proliferation of industry after WW2 with the revolution in consumer goods. This was before things were eventually cleaned up. These emissions counter acted rising CO2 levels. The warming period from about 1970 to currently has been over 90% attributed to greenhouse gases, because solar activity has been low over this period. It’s necessary to remember solar changes are known to have limited effects on warming maximising out at less than half a degree. They can explain some warming early last century, but cannot explain total 20th century warming. So while the correlation between CO2 and temperature since 1900 isn’t perfect visually looking at a graph, there are totally adequate explanations of why. #21 Bernie Thomas > 5) Before mankind, all climate change was from natural causes. And what do you conclude from that? Excellent points in the article, and clear explanations, and all are viable factors. I think a lot of climate denialists may simply be saying climate changed before, and humanity survived, so we will survive if it changes again, whatever may be the cause. Listening to people I think this is a bigger factor than we probably realise. It’s a sort of fatalistic sort of thinking, or a simplification, and obviously naive and missing the potential dangers, and a bit dumb, but could be quite widespread. People simplify, because they find the whole issue huge and hard to grasp. In fact previous climate warming after the last ice age did have significant negative impacts on early human settlements (evidence of periods of significant and rapid regional sea level rise). The book “After The Ice” documents some of this. And obviously greenhouse gas warming could be much more rapid and destructive. Humans are also mostly hardwired to respond to immediate threats with an adrenalin rush and considerable focus. We are not hardwired by evolution to consider long term threats too well, people like Steven Hawking are possibly different in this respect, and others on this website. Human psychology, and related individual differences, are possibly factors in denial, but clearly not the only ones. Rather than ‘leaping to the conclusion’ that any climate science he doesn’t understand must be deceptive, ‘Mr. Know It All’ appeared on RC about a year ago with that conviction already firm in his mind. IOW, he evinced conspiracist ideation (‘CI’), as identified by psychologist Stephan Lewandowsky in Recurrent Fury: Conspiratorial Discourse in the Blogosphere Triggered by Research on the Role of Conspiracist Ideation in Climate Denial. Dr. Lewandowsky’s peer-reviewed research provoked predictable responses from members of his study population. Another characteristic of CI is ‘self-sealing’: any suggestion that a fervently-held conspiracy theory is incorrect, or any evidence that supports a non-sinister alternative hypothesis, is itself evidence for the conspiracy! It’s unclear why ‘Mr. Know It All’ apparently already knows all he wants to know; however, his hostility toward ‘leftists’ and ‘globalists’ is transparent, as if he lies sleepless each night for fear of the crowd of leftist monsters under his bed! It’s likely he’s here solely to forestall any imaginable political gain by his cultural enemies. In any case, evidence-based RC participants have just about given up hope for unsealing the mind of ‘Mr. Hasn’t Got A Clue’. My own responses to him, while I work to make them substantive, are as impolite as I can bring myself to be, in hopes he’ll seek welcome elsewhere rather than repeatedly disrupting worthwhile discussion here; although thankfully, perhaps, it’s not up to me to decide who comments here and who doesn’t 8^}! (5) that humans may not be changing the climate as much as some arrogant climate scientists desperately want you to beleive. OK, let me start with a full disclosure… I am a geophysicist, all my income for my 30 years of professional life has come directly or indirectly from the oil and gas industry. I am therefore a shrill of big oil and my opinion is worthless. Having said that, it also means I understand quite a bit about climate change because without it I would not have a job, there would be no (commercial) hydrocarbon deposits anywhere in the world. The premise of Stefan’s post is innocuous enough. It sounds like an argument a sceptic might put forward, but it isn’t really. Not one of the 4 options is a typical conclusion from a sceptical argument. Most often the “climates have always changed” gets used to refute ridiculous graphs that join low frequency, averaged paleoclimate reconstructions with modern high frequency instrument records. Or when people talk about a “stable” climate for the last 11,000 years. The one thing you learn in Geology 101, and the thing that made geology a science (well almost anyway, speaking as a geophysicist) is the realisation that processes that formed the lithological record are the same now as they were in the past. Before that people used to think that mountains and rivers and coasts all formed ages ago and what we see now is static and “ideal”. This is the same concept that people fight against when climate activists talk about the mythical “pre-industrial climate”. The real poster child for me was Obama’s visit to the Exit Glacier which shows the glacier retreating since 1850. The reason I would use “the climate always changes” as an argument is to say that the earth’s climate is a very complex beast that we are just scratching on the edges. Explain the past with your simplistic CO2-drives-everything model and I will trust you. I am not talking about major P-T transitions or ice ages from solar cycles, explain to me finely interbedded sand-shale sequences. …. and don’t listen to people like Alastair@18 try and explain geology !! This is certainly not just the science but in fact psychology and ideology that these deniers immune from facts. As has been shown as the facts become clearer and more pronounced they will not change their minds, they will harden and become more entrenched. But we should never stop since it is for those who are not hard liners who have not made climate and our energy sources political footballs. Indeed the possible remedies are considered “Liberal” by the opposition which are Republicans an Libertarians who stay in their safe zones and dismiss the idea we have to change our lives fully. To them it is something they consider a defeat that they will believe to be like war. If the Liberals and Left say this needs to be done they will design and build coal powered cars an trucks to piss them off and other nonsense. I come here to get the science. I was at that Coldist site. I even told them that for their little area when the thermal current stops, they will get cold while most of the Earth will heat up. To them they see it only getting colder by carefully picking out only things that represent it getting colder while ignoring the greater amount of warming. They have money to make or just identify with the Fossil Fuel Industries. It has become ideological to them. Our present fossil fuel use even more so in the past are what they consider normal, natural and dare I say “American”. To them eating meat is macho and if you stress greens it is feminine and weak and flabby and Gay. I am not sure just what can be done for them to think it over and change their minds. Even if it was 2050 while the Antarctic is getting low on ice and greening nicely, they would not recognize it. One cannot deal rationally with the irrational and proud of it. Actually, there is not even a requirement to look at data in this case. The ARGUMENT that we can draw a conclusion is logically flawed. The formal logic problem precludes ANY conclusion based on the argument of the form X has always happened therefore we cannot be causing X.
I believe that this is the undistributed middle. This should I think, be pointed out even before we present data. The argument is illogical. Yes, Phil, I was talking to David Appel about the definition of “Radiative forcing”…since he accepted the definition from Wikipedia. 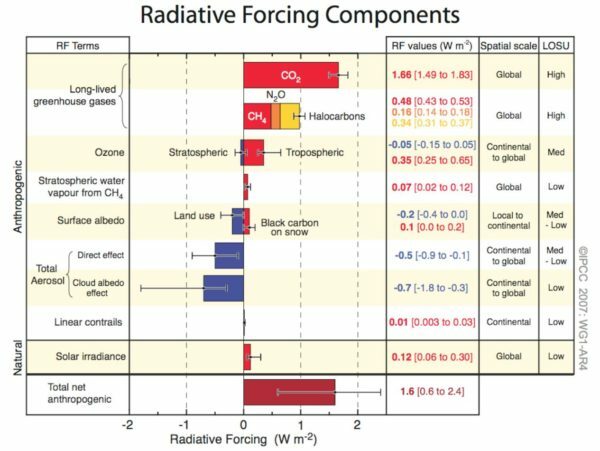 If you now go to Wikipedia and look up the definition of “Radiative Forcing” you will notice that the wording has now changed ..so that the first sentence has been eliminated. Seems that the dishonest alarmist running Wiki, was a little embarrassed. It’s called Paleo-Climatology John, as mentioned in the article. Try this on for size when you have a spare 5 minutes or hour to spend. It’s well to ignore the ignorance of VICTOR @23 SOP. (sigh) However, for the benefit of others…. “The amount of solar radiation passing through Earth’s atmosphere and reaching the ground globally peaked in the 1930s, substantially decreased from the 1940s to the 1970s, and changed little after that, a new study has found. “After rising rapidly during the first part of the 20th century, global average temperatures did cool by about 0.2°C after 1940 and remained low until 1970, after which they began to climb rapidly again. The mid-century cooling appears to have been largely due to a high concentration of sulphate aerosols in the atmosphere, emitted by industrial activities and volcanic eruptions. Sulphate aerosols have a cooling effect on the climate because they scatter light from the Sun, reflecting its energy back out into space. The rise in sulphate aerosols was largely due to the increase in industrial activities at the end of the second world war. In addition, the large eruption of Mount Agung in 1963 produced aerosols which cooled the lower atmosphere by about 0.5°C, while solar activity levelled off after increasing at the beginning of the century. Very true. Of course we have probably all had at least some scepticism of aspects of climate science, but we examine these things, and realise the flaws in denier myths and move on. I would say virtually all “long term” climate denialists are probably driven by political, psychological, or vested interest motives, or similar motives. And turning them around is hard work, like pulling teeth. Some have their power and wealth invested in fossil fuels and will hold on tight, regardless of consequences on other people. They chant denier myths a mantra, but probably don’t really believe them. Or maybe they grow to believe their own propoganda. The human mind is good at fooling itself. Worse still none of us are completely immune from this.